Dueling under the oaks in satisfying an "Affaire d’honneur" was a natural part of Pass Christian's early history in keeping with a tradition that lasted for almost a hundred years. In fact the original Dueling Oaks, are actually some of the very same live oaks which still stand in the Pass Christian highschool yard — and were situated just several hundred yards to the rear of the Pass Christian Hotel. 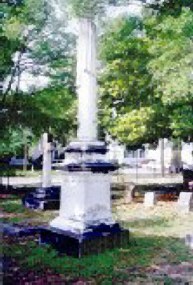 From the silence of the ground in Live Oak Cemetery rises a pinnacle, broken near the top and shrouded overhead by a draped cloth. 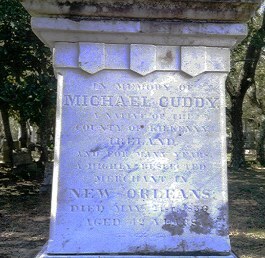 The monument to the last duel fought in Pass Christian which ended in vanquishing a man's heart, his soul and his body; is all that remains in cold, white, marble stoneware with the inscription below dedicated to Michael Cuddy. a highly respected merchant of New Orleans. Died May 21st, 1856, aged 42 years." It happened on May 20, 1856 pursuant to a volatile meeting of two businessmen from New Orleans. That following morning at half-past 7 a.m., the altercation resumed between E.W. Estlie of the firm of Estlie, Lee & Co. on Canal Street and M. Cuddy of Cuddy, Brown, & Co. on Camp Street. Each man had selected their "seconds", who earlier that morning went to the local militia armory to select dueling pistols, which they each carefully wrapped in napkins. The pistols were then placed in the hands of each combatant, and ten paces were slowly counted off. At the first firing, Estlie was slightly wounded, but with the second firing, Estlie's bullet was the messenger of death to his antagonist. Michael Cuddy never breathed again after receiving the ball. Now, only the pinnacle stands, casting its shadow upon the cold, damp church-yard. A towering pinnacle, with shorn off peak, makes a statement even today. 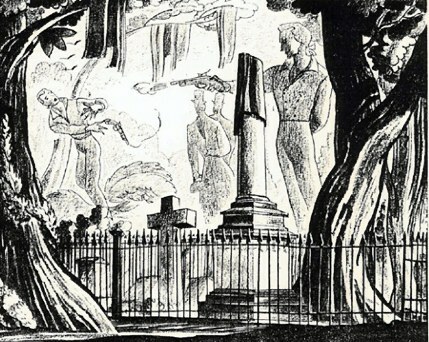 Cuddy's life was interrupted and the marble monument is covered with a mantle of remaining mystery. On the evening before the duel, there was a gala celebration honoring debutantes at a "coming out" cotillion. The orchestra played delightful waltzes and the polkas were quite merry. Michael Cuddy had just finished cavorting on the dance floor with a young debutante of age 15 years. Estlie, having too many drinks, approached the young damsel. This was the setting which resulted in a disturbance whereupon, both of the young men were asked to leave. And the following day resulted in what may have been the final deathly duel in the Pass.